This is a Ghibli film by the studio's 'other', less famous, director, Takahata, who in Japan is still best known for doing the 'Heidi' television series in the 1970's, and who probably had his swan-song with Ghibli with the 1999 box-office disaster 'Tonari no Yamada-kun' ('My Neighbours the Yamadas'). 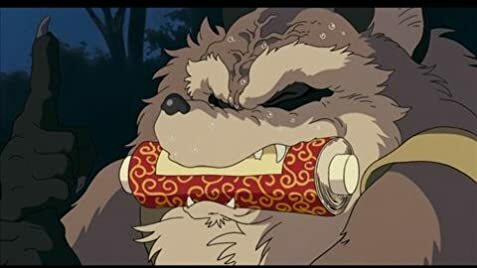 Nevertheless, I think history will judge that his 'Pom Poko' is one of Studio Ghibli's finest works: breathtakingly imaginative and looney, wry, complex, sentimental but un-dogmatic, unapologetically Japanese in its outlook and references. I would in fact rate it higher than Miyazaki's highly-regarded 'Mononoke Hime,' which takes itself a bit too seriously and becomes slightly tiresome as a result. Creatures shown in order of appearance during project poltergeist: - Shadows of hungry spirits. - Inari upon fox. - Foxes (Kitsune) performing Fox Wedding. - Lantern-spirit. - Skeleton. - Umbrella. - Fire breathing tiger. - Oni. - Shoki the Demon Slayer. - Agyo. - Tiny people performing funeral rights. - Raijin (God of Rain). - Fuujin (God of Wind). - Various squids and a fish. - Lantern. - Tengu. - Bulbs. - Bowing child-like samurai. - Maneki neko faced bowing samurai child. - Goblins. - Colorful beetles. - Wife spirit. - Spider. - Multi-headed woman. - Flame. - Skeleton. - Monkeys. - Rabbits. - Frogs. - Ryuu (dragon). - Train. - Dancing flames of white. - Man with reversible face. - Further indiscreet goblins. - Blue goblin. - Snake-like creature with man's face. - Purple spirit. - Camel-faced woman. - Four-legged cyclopic creature. - Mouth-creature. - Two oni. - Seven lucky gods (Benzaiten, Ebisu, Fukurakujo, Hotei, Daikoku). - Blue and flesh-colored goblins. - Walking stone legs. - Animated telephone poles. - Skeleton. - Fire & Firemen. - Tops. - Pill-like structures with eyes. - Flood. - Flying tanuki in flames. - Skeleton. - Seven lucky gods with goblins. - Amida Nyorai with Bodhisattva attendants. Additional Voices: I have no face! The English-dubbed version incorrectly refers to the tanuki as "raccoons". Tanuki are actually "raccoon dogs" - they are in the canid branch of mammals. The English dubbed version censors all references to testicles.